WEST HAVEN -- Alex Jamele grabbed two touchdown passes from Stephen Barmore and scored another on an interception return Saturday as fourth-ranked Southington marched into the Class LL championship with a 45-0 rout of No. 8 Ridgefield at Ken Strong Stadium. Southington seeks its second state title next week against Fairfield Prep. The first came in 1998. "It's an awesome feeling," Southington coach Mike Drury said. "It's what your work for year round. The kids deserve this. They did a great job." Jamele, who broke the state record for touchdown receptions in a season (26), caught TD passes of 22 and 29 yards. His 40-yard pick-6 came early in the second quarter to give the Blue Knights (11-1) a two-touchdown lead. "Everyone does their job. When it's a team effort, you really can't stop our offense or defense," Jamele said. "It's a great feeling. I want to celebrate with my teammates. I'm excited and focused for the next game." Southington's first drive stalled on the Ridgefield 9 and Kyle Smick's field-goal attempt into the wind went wide left, but the rest of the half belonged to the Blue Knights (11-1). On the next possession, the Knights drove 83 yards in nine plays with Barmore hitting Jamele from 22 yards out. A 56-yard punt by Smick early in the second quarter pinned the Tigers (10-3) inside their own 10. On third-and-14 with Ryan Dunn throwing into the wind, Jamele picked off a pass like a center fielder camping under a fly ball and raced 40 yards for a 14-0 lead. A penalty on the ensuing kickoff forced Ridgefield to start from its own 6. Southington linebacker Matt Thomson pounced on a fumble on the next play. The Tigers defense stiffened and Smick booted a 22-yard field goal. A 43-yard run by Will Bonaparte keyed Ridgefield's next possession but linebacker Steve Hamel stuck receiver Stephen Alt for no gain on a fourth-down play. 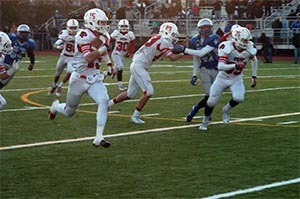 Tyler Hyde ripped off a 50-yard run with Robert Peckham making a touchdown-saving tackle at the Ridgefield 24. Two plays later, Barmore hit tight end Jay Rose inside the 10 and he broke a tackle before stumbling into the end zone for a 31-0 halftime lead. "It's a bad day to have a bad day against a really good team," Ridgefield coach Kevin Callahan said. "They jumped on us early and stayed on us often." An interception by Hyde set up his one-yard plunge early in the third quarter. 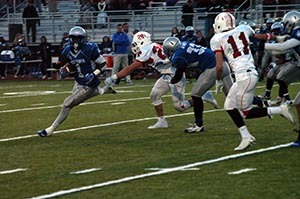 He added a second touchdown with a minute left in the quarter to close out the Southington scoring. RUSHING--Ridgefield: Will Bonaparte 24-168, James Turner 1-2, Ryan Dunn 6-7; Southington: Hyde 22-153, Barmore 8-8, Zach Maxwell 5-34, A. Jamele 1-4, J. Rose 2-11, Matt Natelli 4-0, Luke Krotchko 2-0. PASSING--Ridgefield: Dunn 9-24-2, 46 yds. Southington: Barmore 14-26-0, 192 yds. RECEIVING--Ridgefield: Andrew Chuma 2-14, Erik Weber 1-3, Chris Rossini 1-22, Bonaparte 1-1, Stephen Alt 1-0, Jack Boscia 1-3, Christopher Longo 2-3. Southington: A. Jamele 6-79, Jay Rose 4-57, Joe Daigle 3-27, Kyle Borawski 1-29. TRUMBULL - Colton Smith piled up significant yards rushing the ball but perhaps the most important carry he had in Saturday's Class LL state playoff semifinal round game was a 13-yard loss for safety - a designed play that enabled the Jesuits to run the final seconds off the scoreboard clock to capture a thrilling 29-28 win over West Haven. The seventh-seeded Jesuits, who needed a Thanksgiving Day win over West Haven to qualify for the state playoffs, earned their second win in a little more than a week over the Blue Devils (the Class LL's No. 6 seed) to advance to face Southington in the championship tilt. Prep's Brendan Beiser intercepted a pass at his team's eight yard line with only 1:06 remaining to thwart West Haven's potential go-ahead drive, and help the Jesuits maintain a 29-26 edge. After the Jesuits ran off a few plays and the BlueDevils burned their remaining timeouts, Prep let the clock run down to five seconds remaining then put the game on ice by sacrificing two points to avoid a possible blocked punt. "That's a tall order," Prep Coach Tom Shea said of his team beating West Haven twice in a short span. "And I'm so proud of the kids. The Jesuits had to overcome a West Haven lead to pull off the Turkey Day win, and this time managed to go punch for punch in a back and forth battle between the rivals. "It was a great game. We knew it would be. We envisioned the game just like that," said West Haven Coach Ed McCarthy. "They made one more play than we did." McCarthy said he thought the Jesuits would go on to win the title. He also credited his players for putting forth a strong effort. "I'm incredibly proud of the whole team," he said. The see-saw game was scoreless after one quarter of play. The defensive opening 12 minutes was highlighted by an interception by West Haven's Ervin Philips. The Blue Devils got on the scoreboard first when quarterback Duane Gary connected with Zatrell Lyons for a 29-yard scoring strike on fourth down and 17 yards to go with 9:18 left in the second quarter. Prep got on the board on a safety two plays after punter Stephan Walsh pinned the Devils back at their two yard line. Prep's Anthony Johnson made a tackle in the end zone to make it a 7-2 game with 4:35 to play in the opening half. Prep cashed in following the ensuing kick, when Smith found his way into the end zone from nine yards out. Henry Healy's point after kick made it 9-7 Jesuits with just 1:06 to go before th e break. Although things didn't break West Haven's way in the final 1:06 of the game, the Blue Devils did take advantage of the final 66 seconds before halftime. Gary broke loose for a 65-yard TD scamper with just 17 seconds left in the second. The two-point conversion failed and West Haven held a 13-9 lead heading into the third. The Blue Devils added to their lead on Philips' 65-yard score - a play in which he started up the right sideline before cutting back across the field to get to paydirt. It was 19-9 less than a minute into the second half. Prep answered with a 13-play, 73-yard drive capped by Smith's three-yard run for a TD, and the Jesuits closed to within 19-16 with 4:48 left in the third. Prep's defense held strong on consecutive series, forcing back to back West Haven punts, the first of which was returned 65 yards for a go-ahead score by John DelliSanti. The kick attempt failed but Prep led 22-19 with 2:35 left in the third. In the fourth, the Blue Devils reclaimed the lead on Marshont Little's three-yard run into the paint. Tayvon Gibbs tacked on the point after for a 26-22 lead with 7:56 left. The score was set up by a trick play in which Philips took a handoff and completed a 36-yard pass to a leaping Zatrell Lyons to the three yard line. Prep converted a fourth down on its next drive, one led by the ball carrying of Smith and Crowle, and Crowle scored the decisive points when he broke a tackle and rumbled 33 yards then dove over the goal line with 3:53 left. "That's a great team," Shea said of his counterparts. "They've got play-makers. They've got the winningest coach in the state of Connecticut." Smith was optimistic about his team's chances in the pinnacle game. "I think we have a very good shot. We just have to practice hard, watch film, and we've got to want it," he said. "We've got to want it - that's the biggest thing." WH - Zatrell Lyons 29 pass from Duane Gary (Tayvon Gibbs kick). FP - Safety. Anthony Johnson tackle in end zone. FP - Colton Smith 9 un (Henry Healy kick). WH - Duane Gary 65 run (pass failed). WH - Ervin Philips 65 run (run failed). FP - Smith 3 run (Healy kick). FP - John DelliSanti 65 punt return (kick failed). WH - Marshont Little 3 run (Tayvon Gibbs kick). FP - Nicholas Crowle 33 run (Healy kick). WH - safety. Smith ran ball through side of end zone. Prep - Colton Smith 9-for-18 - 1 INT - 71 yards. Prep - John DelliSanti 5-48; Timothy Falvey 1-5; Nicholas Crowle 1-7. Stephen Walsh 2-11. WH: Marshont Little 7-43. Gary 6-133. Ervin Philips 8-105. Anton Graham 5-24. Prep: Colton Smith 22-94. Nicholas Crowle 17-100. Joseph Ganim 3-32. 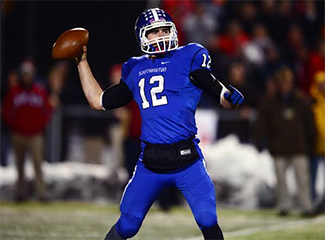 Stephen Barmore completed 22 of 33 passes for 346 yards and four touchdowns and also scored on a 1-yard run and a 67-yard interception return as Southington rallied to beat Fairfield Prep on Thursday night, 52-34, to win the CIAC Class LL championship at Ken Strong Stadium. It was the second state title for the fourth-seeded Blue Knights (12-1). It won its other state title in 1998. Alex Jamele had 10 catches for 230 yards and three touchdowns for Southington. He finished with a state-record 29 touchdown catches. The No. 7 Jesuits finished 11-3. The Blue Knights were giving up considerable size to Prep and trailed, 28-14, at halftime. Southington's defense toughened up in the second half. They allowed 162 yards, but almost half came on Colton Smith's 70-yard run. It also had four interceptions. "We made a couple of adjustments defensively," Blue Knights coach Mike Drury said. "We just told our guys, 'we're not going to stop. We have to be tenacious. We have to be ferocious. We have to get to the ball. We have to continue our pursuit,' all of that good stuff." Junior lineman Matthew Koczera had a game-high 8 solo tackles and 12 overall for Southington. Linebacker Zak Jamele added 10 tackles and lineman Zach Maxwell added eight. "They're big boys, and we knew coming in that they were huge," Barmore (two interceptions) said. "(We had to) play our type of defense, which is fast, physical and swarm to the ball. And we did that in the second half." Alex Jamele caught back-to-back touchdowns of 60 and 4 yards to tie the game, 28-28, with 2 minutes, 17 seconds left in the third quarter. Kyle Smick's 21-yard field goal gave Southington its first lead, 31-28, with over 10 minutes left in the game. Smith scampered 70 yards on Prep's next offensive play. It set up Nick Crowle's 7-yard touchdown run to put the Jesuits back ahead, 34-31. The extra point failed. The Blue Knights regained the lead in a little over a minute as Barmore threw a 7-yard touchdown to Jasen Rose with 8:11 left in the game. Matthew Thomson's interception set up Barmore's 20-yard touchdown to Alec Jamele and pushed Southington ahead, 45-34, with 3:46 remaining in the game. Barmore added a 67-yard interception return for the game's final points. 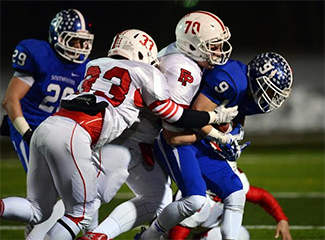 "They stiffened their backs," Prep coach Tom Shea said of Southington's defense. "Hats off to them. They just kept pouring it on. It seemed like it was just one extra guy we couldn't block each time." Smith ran 19 times for 163 yards and two touchdowns. He completed just 8 of 24 passes for 120 yards with a touchdown and four interceptions. Nick Crowle had 26 carries for 178 yards and two touchdowns for the Jesuits. John DelliSanti added four catches for 104 yards and a score. "My senior year, it's just a dream come true," Zak Jamele said.